When I wrote my 38 week update, I posted it onto Facebook and said something along the lines of, “I wonder how many more of these I will write…” Well that was it – my final update – because our little lady entered the world this past week at 38 weeks and 5 days! Meet Eleanor Hazel Willingham. 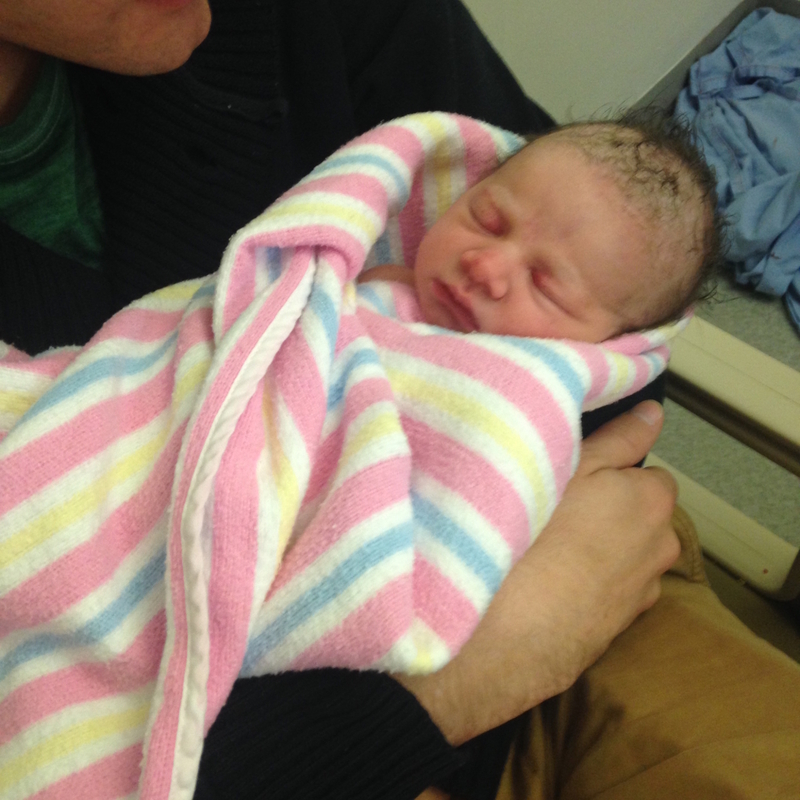 Born 4 July 2015 @ 5:15am, weighing 6lbs 2ou (2.78kg) and 19in long (48cm). The last week+ seems to be such a blur but vivid at the same time. It’s all been a bit out of body. I think every pregnant woman hopes she has her baby a little early within the healthy range, but for as frustrating as I am sure it is to go late, it’s equally shocking when you go early, even within that healthy range. I think for me, I was hoping for it, and I would say I even had a gut feeling that she would be born in the first week of July. However, you just don’t know, and most people expect or at least prepare themselves to go late. Last Wednesday evening, I was having a bit of challenging time falling asleep. It wasn’t out of the ordinary, but I kept getting up to go to the bathroom and couldn’t fall back to sleep when I would return. All that left me incredibly tired on Thursday morning, and it took a bit of effort to get myself going. Around 11am, though, something switched on in my brain, and all of a sudden, I felt everything needed to be cleaned again. I had a huge burst of energy and began tidying, vacuuming, wiping things down, etc. Apparently this happens right before labour, but I don’t think that it’s necessarily predictive of a labour that same day. Later that day, I watched my friend’s daughter and took her for a walk and to play with our other friend and her kids. Throughout the walk I was having braxton hicks pretty regularly, but they seemed a little more intense than normal. I remember asking my friend that day what early labour felt like because I honestly didn’t know how to tell that maybe you were getting ready to go into labour other than super obvious ways. She said like period cramps. I continued on that evening, went to dinner, came home and hung out. I remember around 8:30 saying to Robbie, “I wish there was something super obvious, like my waters breaking, so I would know I was in labour.” I literally went to the bathroom the next minute to just that. I didn’t know it was my waters at first, though, because there was a lot of blood (TMI?). It made me quite nervous, and I was frozen for a moment, unsure of what to do. Robbie calmly said that we should call the delivery suite and ask them what I should do. I rang them, and I explained what had happened. They asked me several questions and switched me to talk and answer more questions with a midwife before saying, “If you have someone who can drive you to the delivery suite then come straight away, otherwise, you could call an ambulance.” No big deal, right? Just call an ambulance. That didn’t help my worrying, but in the time it took from then until the hospital, I was becoming more convinced that it was my waters because it didn’t stop. I kept leaking, and it was becoming more clear like waters. Leaking in public – you just get on with it, but it’s a ridiculous feeling haha. We arrived at the hospital a little after 9pm and got settled into a delivery suite room. They hooked me up to check on baby. Her heart rate was around 180-200 – extremely fast – and they decided to hook me up to some fluids to see if it would bring it down. I had to hit a button every time I felt her kick, and fortunately that helped them to determine that she was responding the right way. After a couple hours of fluids, her heart rate came right down in the 140s, and she settled. They made an appointment for me later that day (Friday now) to be checked out if I hadn’t gone into labour, and then said they would induce me Saturday morning if I hadn’t gone into labour on my own by then. I was really praying at that point that I would go into labour on my own. It’s pretty crazy how just sitting at home on a Thursday night can suddenly become the beginning of a life-changing event. We got home around 2am, and we went straight to sleep. I tried sleeping, but as I was laying there I noticed a contraction. Another 10-15 minutes went by, and I noticed another one. I remember saying to myself that if I had another one, I would get up and go into the living room so I could work through them. Sure enough another one hit, and I went out to our living room and set up camp. I had one of our couch cushions on the floor, and I sat on my knees and then draped myself over a big exercise ball. It was one of the few ways I could work through the contractions because they were mostly in my back. I kept working through them, keeping track of them with an app on my phone. By 7am, they were getting a few minutes apart and increasing in length. I woke Robbie up at this point so he was aware that we may need to go to the hospital again before my appointment at 2pm. I think we called around 8:30, and I told them what was happening. They gave the same answer they seemed to always give – “If you think you need to come in then go ahead, but if you want to continue labouring at home then I think you will be ok.” From our classes, we knew that contractions every few minutes for 40-60 seconds that were painful was the signal to go in, so we headed to the hospital. Car rides and labour are a horrific combination. I am just saying – if I could never have to ride in a car while in labour again, I would be very happy. The contractions picked up on the way there, and I felt like we couldn’t get there quick enough. We arrived around 9am and got sent to Birth Centre Room 3. I kept working through the contractions, but unfortunately, they started slowing down. The reason for this and the back labour was all because Eleanor was posterior, which we didn’t actually find out until way, way later. Often when babies are posterior, you start to labour and it picks up all before slowing down again or nearly stopping. This is all our body trying to get the baby to turn. Posterior means her spine was against my spine, even though she was still head down. This is why I had back labour. Then came the frustrating part when they told me that they don’t generally admit people until they are at least 5cm along, so they sent me home again to keep labouring there. It was pretty frustrating to get sent home at this point. I had thought the next time I would go home would be with our baby, not with more contractions. We grabbed our stuff and headed to the car. Another painful car ride home, and we were back in our living room working through contractions. Robbie was so good, and he was trying to get me to eat and keep drinking water. Absolutely nothing sounded good, and I couldn’t even swallow a bite of toast. I tried getting in our bath, and although that offered a little relief, it was too small to find a comfortable position. Around 4:30, after being home for another 5 hours with contractions picking up and then slowing down, picking up and slowing down, they were getting quite intense and hard to breathe through. I started getting contractions in the front as well around this point. I could handle those, but the back labour was getting more and more intense and painful. I called back to see what they thought, and I got the same answer. I told Robbie I would try to make it until 5pm. At 5pm, I felt like I wanted to go back in, but I was too scared to go and just be sent home again if I weren’t at 5cm. I couldn’t handle that again, so I had Robbie call them and ask them if they would send me home again if I weren’t to 5cm. They didn’t really give him an answer, though, so he said it was really up to me. I felt like I needed something to help get through the contractions, even if it was just the giant bath tub in the Birth Centre so we headed back. This car ride was the worst. Contractions were happening almost every minute, and I wanted to crawl out of my skin. I don’t think I opened my eyes the entire way there. We walked in, and somewhere in the midst of my concentration on my contractions I had this thought about how ridiculous I must of looked to all these people. They would clearly know I was in labour. I wondered what they thought. We went back into the same room, and I immediately got into the bath. It was really helpful. I was able to move around a bit more, and it was really warm. Throughout the day, I would have Robbie put counter pressure on my back to help, and he continued to do that. The bath had a shower head as well, so he would put super hot water on my back as I went through each contraction. I stayed in the bath until around 8pm when the midwife came in and wanted to check me. At this point, I hadn’t slept in 33 hours, and the midwife was concerned that I was getting dehydrated even though I was trying to drink as much water as possible. She recommended that I get hooked up to more fluids after she checked me. Unfortunately when she checked me I had only progressed to 4cm. 9 hours with only 1cm to show for it. I was so frustrated. I decided that I would try some morphine at that point to see if it would help me get through the contractions or at least settle a bit to regain my strength. They gave me both around that time at 8pm. The morphine did absolutely nothing. I knew it wouldn’t take the pain away, but it didn’t even take the edge off. It didn’t help, and by 10pm, I was really struggling to get through the contractions. They would hit so quick and hard that I couldn’t catch my breath. I started thinking about an epidural at this point even though I had previously not been keen for one at all. Around 10pm, the midwives switched over. Sarah had been wonderful, and I was sad to see her go. She traded out with Jeanette who was also wonderful and would see us through the rest of the delivery. Jeanette came in around this time to check me. Another 2 hours, and I was still at 4cm. The morphine hadn’t helped. I was exhausted. I told her I was considering an epidural, but I asked her to remind me of the downsides to see if I could convince myself to keep powering on. To my surprise, she was actually very encouraging about me getting an epidural. She said it could help me progress further at this point because of how tired my body was. I thanked her later for her encouragement, and she said that if I had only been there for a couple hours, she probably would have pushed me a little longer to go without but because I had been in labour all day long, she felt like it was a good call. Her response was so helpful to me. With the two options at the hospital – delivery suite and birth centre – I knew the birth centre was way more natural. That was what I had hoped for, although I had tried not to have any concrete plans because I knew labour would be unpredictable. Having her be encouraging about the epidural was enough to convince me. I asked Robbie how he felt about it, and he was really supportive either way. I think he was slightly conflicted because he knew prior to going into labour that I was really not keen so he was trying to balance encouraging me to keep going and encouraging me to do what I felt was right. At that point because of her response, the fact that I hadn’t slept in nearly 36 hours, was dehydrated, wasn’t progressing and the morphine didn’t help at all, I decided to be moved to the delivery suite and get an epidural. It took me awhile to come to terms with something I didn’t initially want, but at that point, I was more concerned with making it through the whole labour. I didn’t think I would have enough stamina to keep going if I kept not progressing. After it was all done, he told me I would feel another few contractions before it would really kick in. Each one got lighter and lighter, and I felt such relief after 20 hours of labouring without it. We were able to relax a little, and they put some mats on the floor for Robbie. They put the lights low, and we tried to sleep as best as possible. I was all hooked up so they could monitor the babies heart beat at this point, and I kept watching that in between resting my eyes. Around 1am, Jeanette came back in to look at the heart beat, and she realised that it was a bit all over the place. She called some Doctors in to have a look. At this point, they checked me again, and I was still at 4cm. They also started feeling the baby’s position, and this was when they realised she was posterior. They turned me on my side to see if that would help, and I noticed the tightenings again right away. They weren’t painful, but I could definitely feel something happening. About 30 minutes later, they also put a small dose of syntosin (pitocin in the US) in me to make sure the labour kept progressing. A couple hours later at 3am, Jeanette got the doctors again. She had been noticing that baby’s heart rate was dropping for longer periods than before and was quite concerned. One doctor came in and looked, and she said that they were going to do a scratch test on baby’s head to check her lactate level. Lactate basically shows how fatigued our muscles are, and it would tell us how stressed out the baby was more than just the heart rate. If it was above 4.75, they were going to take me for an emergency c-section. At this point, I wasn’t at all concerned with having a c-section – I just wanted the baby to be healthy. About 5 minutes later, though, another doctor came in and said she wanted to check me first. She said that if I had progressed from 4cm, we may not need to do that. As she checked me, a huge smile spread across her face, and she said, “YOU’RE AT 9cm!” That was so incredible to hear. I had felt like my body was doing something, and to have confirmation of that was so exciting. About 30 minutes later, I was at 10cm and fully effaced, and they gave me a passive hour before pushing. Around 4:15am, I started pushing. I was so thankful for the epidural because at this point, I felt like I actually had energy again to push. I started pushing, and Jeanette and Robbie were giving me such positive feedback. One of the doctors came in at some point, and they were all so encouraging. I would wait until I’d feel the tightening and then push with everything I had in me. For as challenging of a time as I had with contractions, I feel like I was a really good pusher. Sometime after 5am, her head started to actually stay out a bit each time rather than going back after each push. Then around 5:10am, I pushed her head out. I was gearing up for another push, but they told me to wait for a minute. She had come out with her hand next to her face, so they were trying to rearrange her so she wouldn’t get hurt. 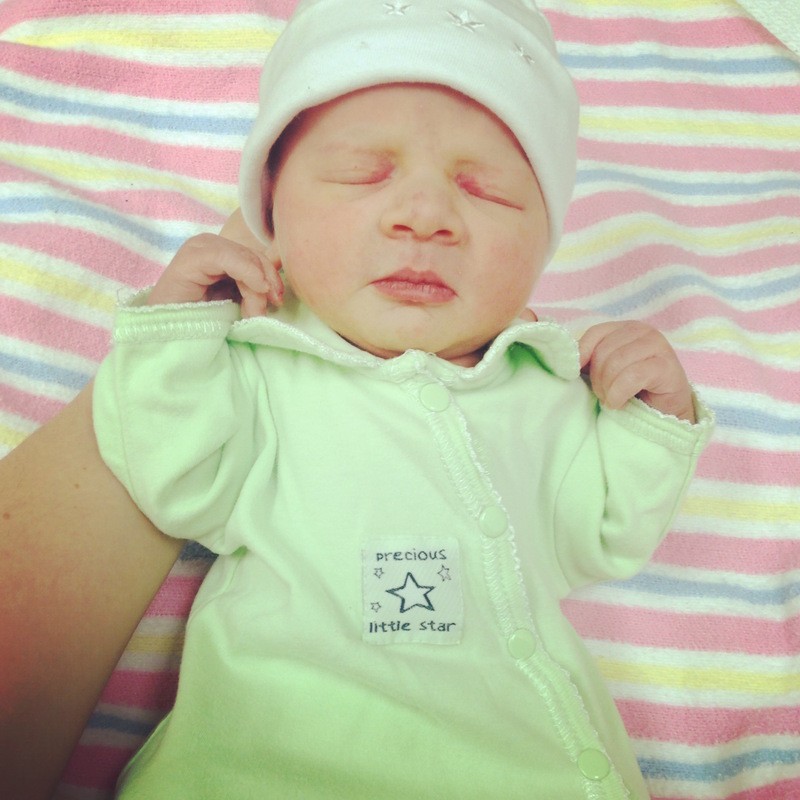 As I am waiting to get the go ahead to push again, before my eyes a slimy, beautiful baby was placed in my arms. It was so shocking and incredible! I cried and cried, and then we lifted her up and I said, “IT’S A GIRL!” It was such an incredible moment. I will never forget that moment. After 26 hours from the first contraction, Eleanor Hazel was here, in my arms. It was amazing! Giving birth was definitely one of the hardest things I have ever experienced. I am thankful for her story, though, and I am thankful that it’s all over now! You really never know what will happen when you go into labour or how you’ll handle it or unexpected bumps in the road. It’s an incredibly profound experience, though, and I am very amazed at how God created our bodies to do this. Over a week later, it amazes me that she was inside me not so long ago. I love you little Eleanor! Thanks for making me a mumma!